I’m at the part where the end is more than in sight, its really right around the corner. And what you would think would be the easy part became a slight frustration – not because the process itself was hard but rather just getting everything just right. If you will remember, I left off having finished the inserts on the arms and the front band. This is key because waiting to do the inserts last as with many chairs would have made for some real interesting complications in this reupholstering project. Unlike most chairs, where the inserts are added last through glue or these cool tacks that go between the tuft and the cardboard before being hammered on, as you saw, these had to wrap around the side of the chair and under the front band. These frayed edges from the arm inserts get covered up from the back but they also mark where the back ends on the arms. Using the original back piece from the chair’s previous life, I cut out the basic shape of the back and arms. Decking is similar to but stronger than muslin and is generally used for backs of chairs. That said, if you have extra scrap fabric, you can use it too. Slightly awkward since I was in my kitchen, I laid the chair on it’s face – with plenty of towels for protection – so I could drape the decking over the back. I tacked the decking into place, making sure to pull it tight. I trimmed the excess off but made sure I left about 1 inch all the way around. Using my new fancy shamncy on sale pneumatic stapler, I stapled the decking on to the back of the chair. I pulled as I went, stapling the top, then the bottom and lastly the sides. To keep the pulls (technical term for extra fabric) for future if needed, I took the excess fabric, folded it into the chair frame and stapled it down. Awkward but easy. Okay, so ply grip is this bendable metal strip that has teeth or grips that allow you to make smooth curves and seamless edges on upholstery items. While I fully understand its benefits and necessity, I hate ply grip. I cut the ply grip to the size I needed, bent it to the shape that was required and began a litany of four letter words I am not so proud of as my staples kept breaking as I attempted to adhere the strip, not to mention every two staples the gun getting jammed from the broken staples. Not a happy camper by the end but my ply grip was attached to the outside edge of the arm, alligator jaw edge facing out. Then, you fold over the free edge so the alligator mouth is closed. 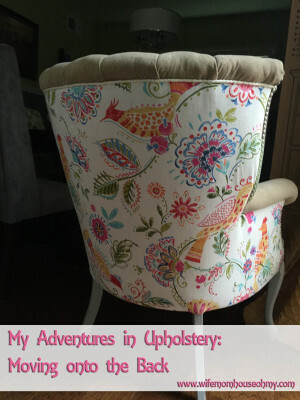 Yes that is my term and descriptive as opposed to a real upholstery term but I bet you can figure out what I mean. This was it! The moment I had been waiting for. My chair would be a chair once more! Okay, a little overdramatic but this has been a long time coming. I laid out my finish fabric, took my old fabric as a pattern. laid it on top of the finish fabric and start to panic. It was about three inches bigger than my finish fabric. After realizing I can’t turn it on the bias, I can’t turn it on the horizontal and after another round of four letter words I am not proud of, I fought back the tears. Then I remembered. My teacher had me take off an edge roll that would account for about two to three inches on each side. I measured to make sure. Yep, should fit. Tight fit but should fit. Cut out the pattern and repeated placing the chair in its awkward but protected position from step one. Okay, I’ll admit it I am too lazy to type out how to make and attach a welt cord again so check out how to from this post. To attach the fabric piece to the chair properly, I needed to attach the top first, the dacron and then finish stapling down the rest of the finish fabric. Just as with the front band, I stapled the underside to the top of the chair, pressing as close as possible to the channels and stapling parallel with the welt cord. Next, I added the cardboard strip for support just as with the front band. However, I stapled at an angle this time to give it extra support. This I liked. It was super easy. Cut to size, spread the edges all around, and stapled the bottom layer to the frame of the chair. Super easy. Super fast. I needed this step after several full of frustration and stress. So the top was pretty easy. A no brainer really as you can see from above. The rest, not so much. First I pulled the finish fabric tightly over the Dacron, making sure to smooth as I went. Next, I pulled down and tacked at the bottom of the frame to make sure the line of the center was straight. I kept pulling and tacking, alternating back and forth from that center tack to keep the line was straight. I repeated this on the sides. I left the arms loose for now. Down the sides of the frame, I stapled the fabric in place. Next were the arms. With the chair upside down, I stapled the fabric flush with the underside of the arms. To do so, the inverse of the fabric should be showing. As with the welt, I added a cardboard strip that gave it structure and shape. It gave it a smooth edge. Then, I stapled the bottom of the fabric to the underside of the frame, making sure to start from the center and work my way out the end of the arm. At the legs, I made release cuts on each side, folded the edge on the legs under to create a fold at the leg. I did this as I got to them, not after. That left the ply grip. And yes, you guessed it another round of language I’m so ashamed of but have to admit to in my frustration. I did say I hated ply grip. So, ideally, you pull your fabric taut, use your regulator – larger end – and press the fabric into the ply grip so the teeth grab it. Press the teeth closed and use the pointed end to get the rest of the fabric in to the ply grip. Lastly, hit with rubber mallet to make sure the ply grip is fully closed and secure. I said ideally. It took multiple tries, a few breaks and some really heart felt swear words to get it done. The process was the same – just not as easy as described above. Hopefully that gives you hope should you encounter similar frustrations. It does eventually work. Believe it or not, the chair is almost done. We are talking the bottom and finishing touches and ALL DONE!!! I so can’t wait! And if you have a DIY adventure, upholstery or otherwise, that you finished with frustrations you learned from, I’d love to hear about it! Let me know in the comments or email me! Until next post.